Authorities respond to a shooting in the city of Banning on Saturday, Sept. 26, 2015. 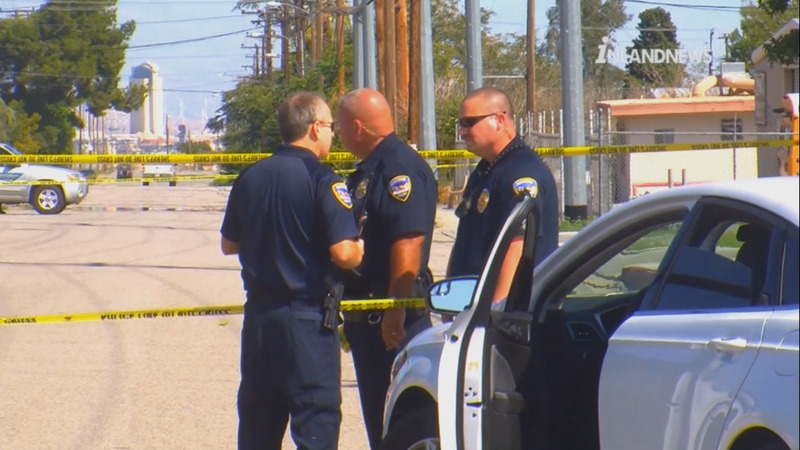 BANNING, Calif. (KABC) -- An investigation is underway after a series of random attacks in Banning on Saturday left two people dead and three others injured, authorities said. The suspect was taken into custody, but not before carrying out attacks at five different locations within an hour. "We don't have any information verifying that the victims knew the suspect or that the suspect knew the victims," said Banning Police Chief Alex Diaz. "At this point, it's looking like just some random acts of violence in our city." The violence began just after 11:30 a.m. Two men sitting in a red car were ambushed. The driver, identified by family as 66-year-old Paul Lesh, known as Joey to his friends, was killed, and the passenger was injured. The suspect was in a white SUV. Moments later, more gunshots went off. "I saw a car pull in, windows shattered, it looked like two bullet holes through it," said Michael Pelegrin, a witness. "An older Hispanic lady hopped out. She had blood on her." The woman pulled into an Arco gas station after a suspect in a white SUV opened fire. "They said they were just driving by, and they just shot at them," said Pelegrin. Ten minutes later, there was another attack at another Arco station. This time, the victim was brutally beaten by the armed suspect. "He was getting in his car, and the guy just came out of nowhere, just was hitting him with the back of the gun. All over his face he was bruised," said Efrain Meja, an employee. The victim was identified as 78-year-old Major Maxwell. He was seen leaving the police station. His head was bandaged and his face and neck black and blue after he says the suspect tried to choke him. The violent assault was captured on the gas station's security cameras. The next victim was gunned down as he drove along the street. His pickup truck crashed into a cement wall. Almost an hour after the terror began, the suspect in a white Chevy Tahoe was finally tracked down in Beaumont after terrorizing more victims while trying to break into a car. "When he was trying to enter the vehicle where he broke the window, there were small children in that vehicle, and he was asking if his children were also in the vehicle," said Beaumont Police Chief Sean Thuilliez. Police say the suspect's family, including his children, were safe at home. In his vehicle, authorities say they recovered a weapon, but the search continues for a motive to the deadly crime spree. "We won't know until we interview him. We won't know what his state of mind is. We won't know what the motive of the attack was," said Diaz. The suspect has only been identified as a Hispanic man in his 30s. Investigators say they don't know if drugs, alcohol or mental illness were factors in the violence spree.